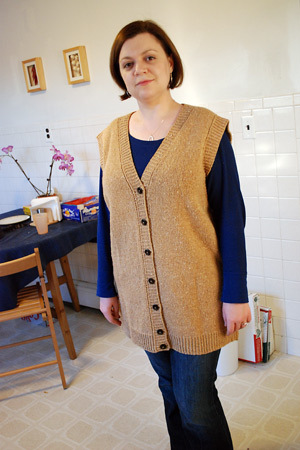 Pattern: A basic women’s vest with input from Her Llama Cardigan (Knitting Classic Style ), Portland Tweed Zip Vest, and measurements my mom took of some of her clothes. Described in more detail in this introduction. Yarn: Jo Sharp Silkroad DK Tweed in Butternut (#419), 9 skeins (that’s about 1300 yards, for those who are counting). My thoughts about this yarn are in the abovementioned introduction, but to summarize, I really love it :). Needles: Addi Turbo and Susan Bates circs, US 5. I used slightly smaller needles to get a denser fabric, to combat any potential stretching and loss of shape. My gauge was close to 5 stitches and 8 rows per inch. I used the same needles for the ribbing (as opposed to going even smaller), because twisted rib condenses itself nicely as is. Finished dimensions: About 51″ across the bust, 47″ at the waist, 49″ at the hips. It’s a very long vest, as you can see: 20.5″ from armpit to hem, and another 10.5″ armpit to shoulder (31″ total). 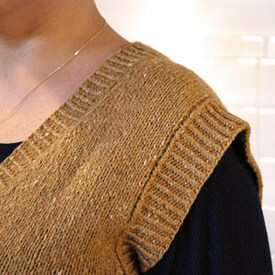 Here’s a picture of the vest in indirect light (though the model is the wrong size), which I think showcases the true color much more accurately: it’s a warm caramel with pink undertones. Taupe can be a harsh color, but I think among all the different shades of taupe, this is the best possible scenario. Pictures on the left: twisted rib armholes and button bands, picked up from edges which themselves had a narrow column of ribbed stitches. Pictures on the right: some twisted rib stitches at the seams; pretty dark brown buttons with light centers from Windsor Button (sorry it’s buttoned a little crooked). My mom was very happy with her new vest, and even suggested that I knit another! I’m not sure I’ll follow through, as my stockinette willpower has been exhausted for the foreseeable future. (At least the color suggested for the second vest is deep teal, which is a whole lot more interesting than taupe.) 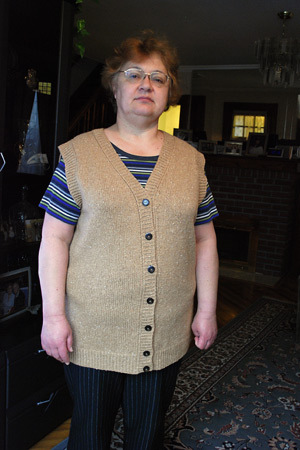 However, were I to knit another, the vest could be improved in the following ways: work a few decreases in the armhole ribbing right at the armpit, and shorten the whole thing a few inches, as this vest peeks out from under my mom’s lab coat. Nice work! I hear you on the endless s/stitch. While it’s nice to have a bit of mindless knitting, it can get very tedious quickly. Lovely work. 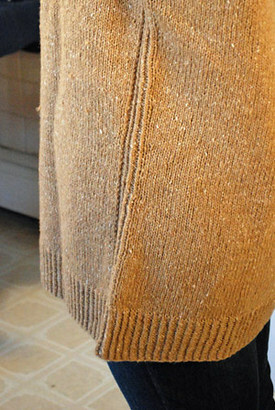 The narrow ribbing along the inside edge of the front bands and armholes are a really nice detail. The twisted rib at the hems is gorgeous! What a lovely detail. It looks fantastic! 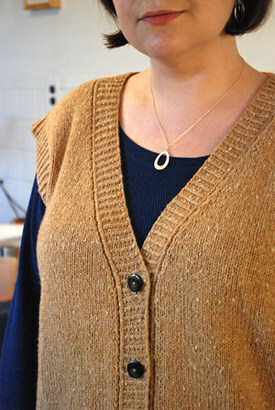 The picture of your mom makes me smile…grumperina;) She must love it because it looks just perfect on her. That yarn is one of my favourites. i’ve knit a few big projects with it with great success! Happy New Year! Wow! You do such amazing work, such attention to the little details. 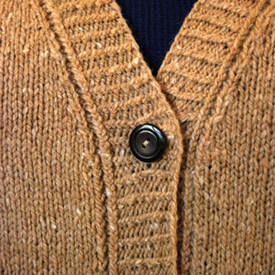 You’ve taken a plain old vest and made it really special. Congratulations! Oh what a lovely colour! It looks fabulous on your mum. This vest is amazing – I’m always astonished at the attention to detail you have and the way you execute it. what a pretty vest. it’s good to know the real color I like alot! I love all the twisted stitches! You’re so generous with your knitting, especially to make what they really want. I love that your mom has a lab coat! oy. you really love your mom! 🙂 as usual, it’s beautiful and so well-made. i really like the side seams. it almost looks like a pocket! Superb job!! Now – my money is on a second vest – soon – just alittle shorter so it doesn’t hang out from under her labcoat. Or else – maybe a longer labcoat? till the second vest is done! Always enjoys your blog – what will be your next project for 2010? Great job, & what dedication from a daughter. Thanks as ever Kathy for the close up shots & detailed commentary. Belated Happy New Year to yourself & Mr Sweetness. Your mom’s new vest turned out very nice. Happy New Year! Beautiful vest. This is the sort of project that, to me, looks like it cries out for a mid-gauge knitting machine to zip out the St st. Then you can do the more interesting stuff by hand, and have a vest very very quickly. I stockinette because I love. happy new year and congrats a fantastic knit! Very, very nice. Your detail work is exquisite! I’m still giggling about the “stockinette commitment” tag you posted on some of these pictures. Commitment INDEED. Are you going to post a “dangerous projects 2010” or new year’s knitting resolutions? Love the photo of your mom. Like mother like daughter? (No smile!) And I really love the vest–like the length of it very much! Great job! Terrific! What an accomplishment! Be proud and knit on! What a beautiful gift! My mom is probably the only other person that I’ll knit sweaters for other than my husband. I know she’ll appreciate all the time that goes into a knitted sweater. It seems like your mom appreciates that as well. Can’t wait to see what you work on next…I really appreciate your love of the “details”. What a beautiful gift! My mom is probably the only other person that I’ll knit sweaters for other than my husband. I know she’ll appreciate all the time that goes into a project like that. It seems like your mom does too. Can’t wait to see what you work on next…your love of the “details” makes your blog so enjoyable to read! You are the best daughter ever! For reals. You are the sweetest, most thoughtful daughter/granddaughter ever!! I love both photos, great seeing how the vest fits on both of you. wonderful as always!!! The vest looks great. Such beautiful stitches, no wonder your Mum is happy with it. happy new year!! that is a gorgeous vest! bravo! 🙂 so cute! wow… it is really beautiful. Happy New Year. Congratulations on your wedding anniversary from the other side of the world – not yet anniversary time in Boston Mass. – being 9.00 am here in New Zealand, but in anticipation, happy anniversary. I hope it is a good one. Love to you both. It’s beautiful! I bet it’s keeping your mother warm both on her body and in her heart. Best wishes for another wonderful year. What a wonderful vest for you mom. I hope she wears it to pieces.